Ohotaq Mikkigak is of the generation of Inuit artists who grew-up on the land and visited settlements like Cape Dorset for supplies. He fondly remembers the traditional elements of his childhood which gave him a close connection to his cultural ancestry. In 1958, after meeting his wife Qaunaq, a graphic artist, sculptor and throat singer, in Nuvukjuac, they were married in the camp. They moved to the settlement of Cape Dorset which offered the resource of schooling. 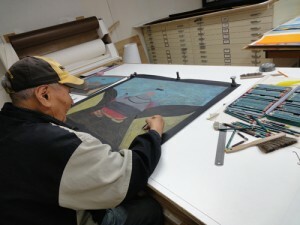 To make a living for his children, Mikkigak started to carve, learned the art and produced works, but put it aside when the financial stability of a janitor position became available at the local school in 1970. When he retired in 1999, he started drawing again. 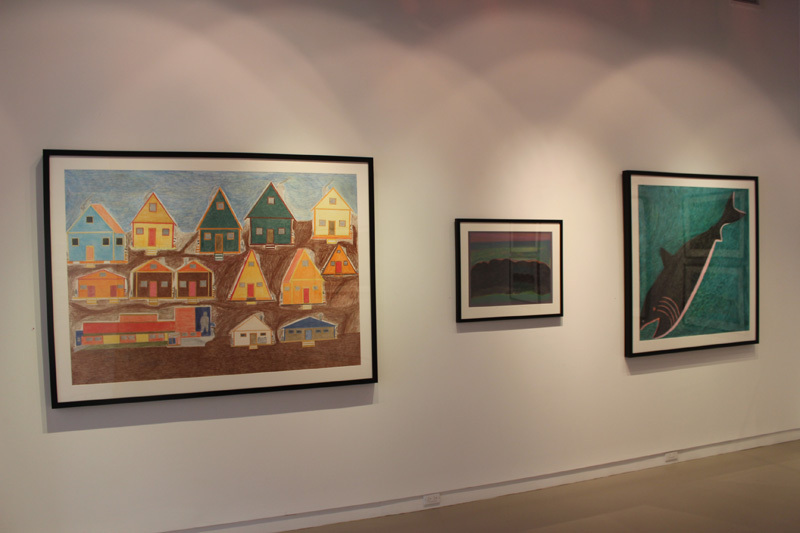 His early work seen in various print collections over the years, included figures, animals, and fish; all lyrical and whimsical, and all derived from his experiences living in Cape Dorset. He was particularly adept at showcasing the movement of animals. He was attracted to and enjoyed their antics – and their ability to break away from the earth at will. As he observed them soaring above the landscape, he became aware that what they saw he could only imagine, and so he used his imagination and his drawings to create his own unique and personal landscape visions. Natural phenomena of the landscape which impacted his imagination were the magical and striated colour fields of the rainbow. A uniquely summer experience, the rainbow is a rare and wonderful event in the north. The word ‘rainbow’ in Inuktitut is ‘suka’ and the Inuit are always happy to see the rainbow because for them traditional legend maintains that the ends of the rainbow appear to be holding the world together. This beautiful apparition of skyscape architecture, and the many colours it embodies, has been referenced in Mikkigak’s drawings, and has informed many of the elements in his natural world, adding depth and character to the water, the land, and to the sky, regardless of the weather or the season. 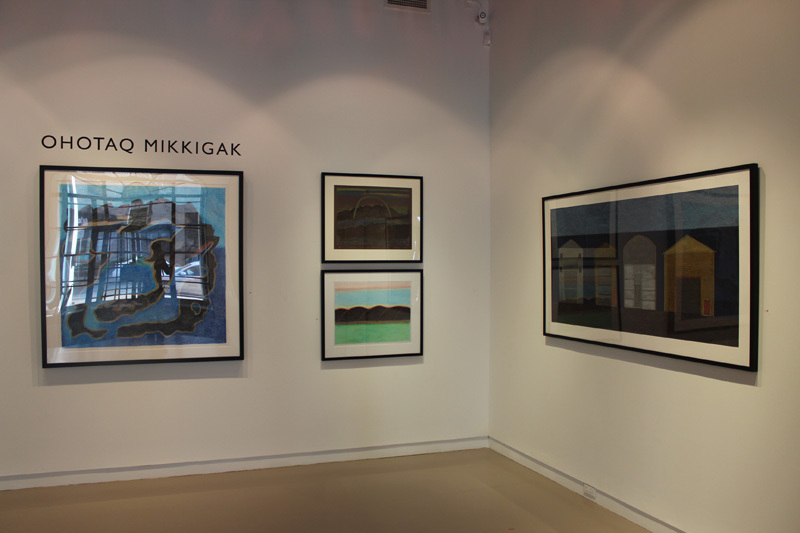 Now 76 years old, Mikkigak has refined his landscape images with colour bands that reference the architectural motif of the rainbow and these also enhance perspective, and draw the viewer into the most powerful elements of each work. 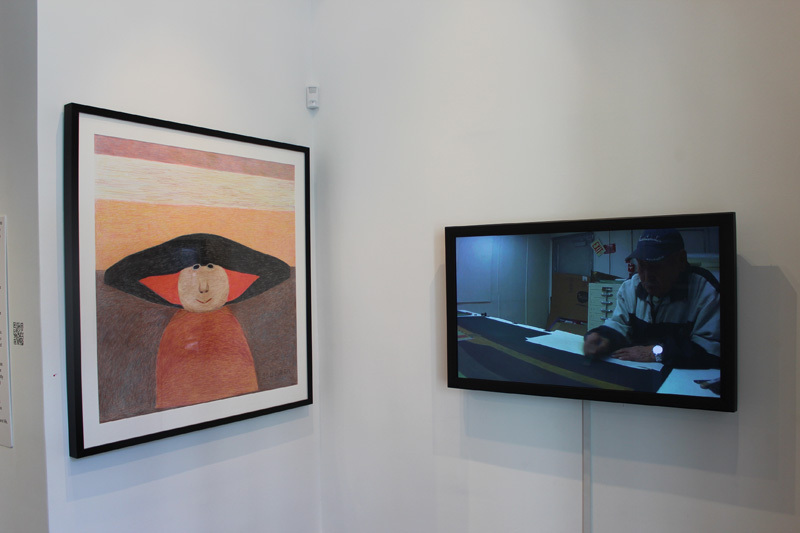 Over time, Mikkigak’s drawings have become large scale works on paper where his medium has accomplished depth of colour, tone, and amplification of image effect. For subjects on the move, Mikkigak changes the alignment and length of the pencil applications. This emphasizes speed, direction, and provides a dynamic which simulates what only the spirit of life can impart. He also uses a frieze technique to facilitate repetition and direction, and this conveys added thrust and movement for sled, Inuk, and running birds alike. By simply switching the viewpoint, objects drawn from above appear to carry a mystery of purpose. Emerging from a white field, Mikkigak’s whimsical houses are friends and neighbours, reflecting life and community activity from each of their windows. Even common homes achieve an unexpectedly bright impact and presence through the artist’s choice of paper background, colour intensity, and use of line, as with “Windy Day”. 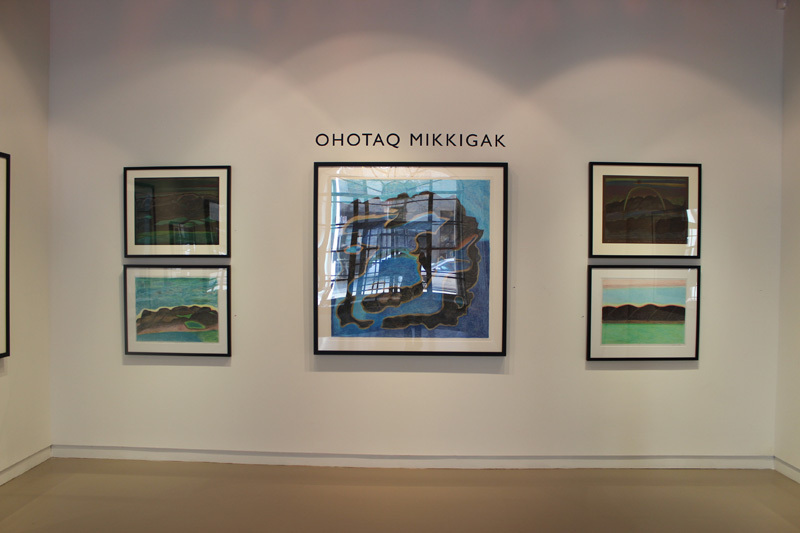 Ohotaq Mikkigak brings his personal artistic passion to the resources of the physical landscape around him, and from a complicated and changing reality has produced dazzling new works suffused with both colour and life. Ohotaq has a creative and instinctive approach to composition which allows him to create movement and playfulness among the characters in his images. 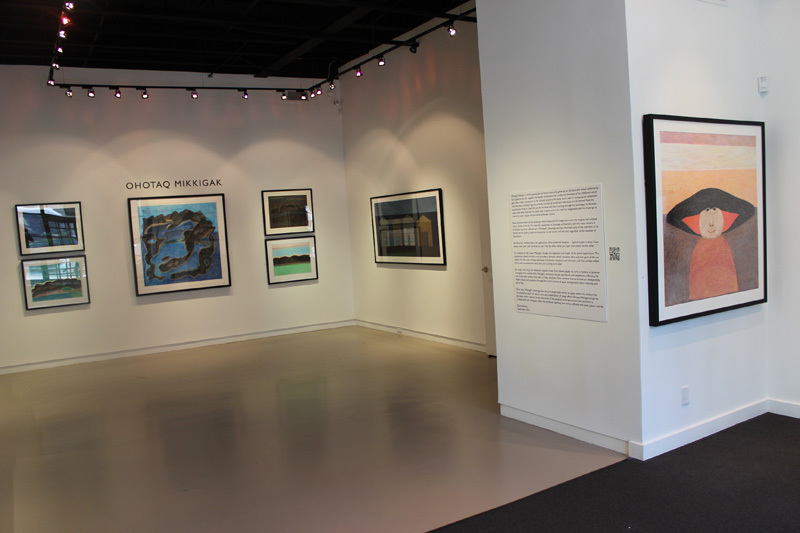 For decades, these subjects translated very well to printmaking. With balanced and thoughtful compositions these images exemplify his skill at rendering his imagined figures into completed works on paper. Drawings like Composition (Figure with Two Fish) display transitional elements in the artists’ style, incorporating both the centered and symmetrical elements of his traditional figural images as well as the evocative, blended lines of his landscapes. In drawings such as Transformation Mikkigak shows us his new figural motif that combines seamlessly the colour and flow of his landscape drawings with expressiveness in his characters. These bands of layered colour create a depth of feeling that is specific to the artists’ newfound landscape motif and can often take on an abstracted appearance. This paired with a more minimalistic depiction of his figure combine for a very contemporary image. However, the contemporary appearance of his work has less to do with a deliberate abstractionist approach and more to do with his style and technique while drawing. With broad, expressive strokes and repeated, careful layering with the pencil crayons, Mikkigak creates emotive, modernist images. 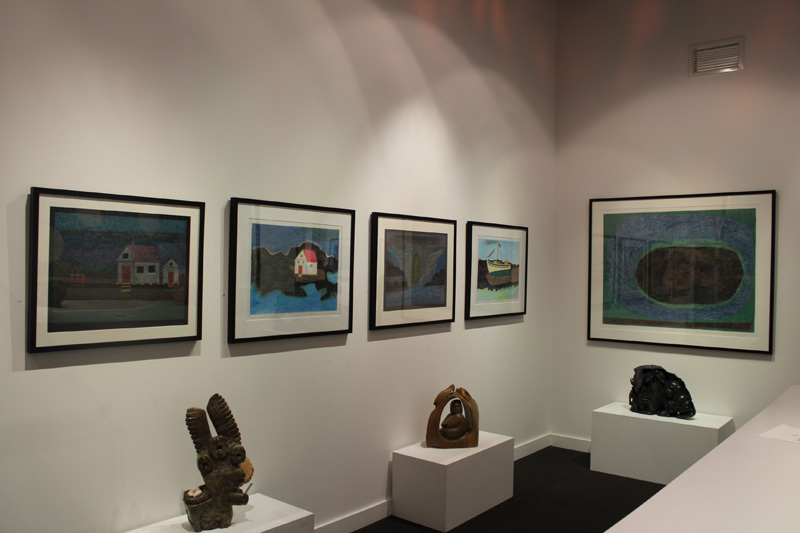 For the most part, these are depictions of the world around him – the lakes, rivers, hills and rocks of the surrounding islands of Cape Dorset, as well as the houses and buildings of his community. Even simple objects such as a Hot Kettle are transformed into magnificent subjects both by the size of the drawing and the swirling, moving colours of the setting in which the teapot sits with flames rising up from underneath. The houses, garages and boats from his community become powerful subjects when portrayed with such colour and starkness on the black paper background so that their everyday qualities become mysterious within the bold compositions. Mikkigak combines both real and imagined subject matter into his drawings to create surreal yet relatable images. Balancing out Mikkigak’s uncanny ability to create seemingly abstracted images without deliberately abstracting them, he is also able to portray the same type of subjects realistically. In drawings like The Airport he has produced a detailed and specific portrayal rather than a more anonymous and mysterious community building. He is drawn to the land around him and portrays the colour and sensibility of one who closely observes and carefully renders the intricacies of his environment. It was his interest in large-scale paper that was the catalyst for his transformation in style, but it is his approach to the large sheets of paper – not destined to ever be prints by their sheer size – that has allowed him the freedom to explore not only the limits of the page and the medium, but also of his own creative and technical abilities. 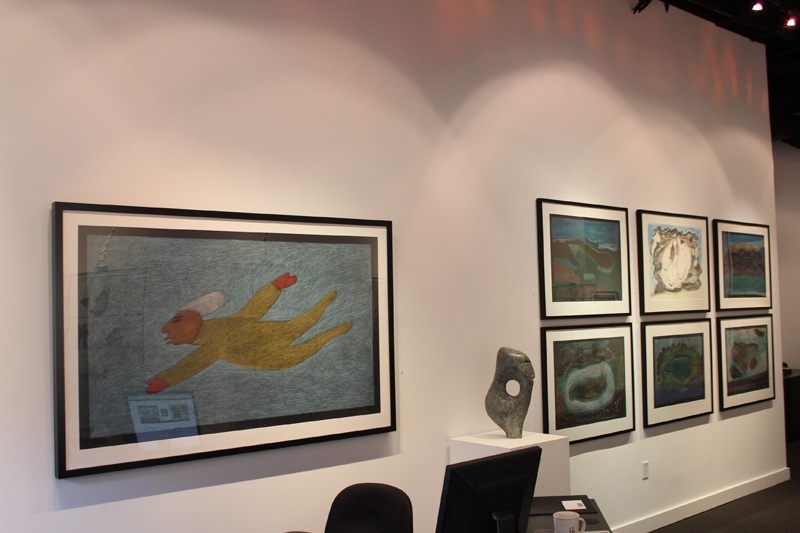 His variety and skill with his work has shaped him into one of the most dynamic contemporary Inuit artists today.